Global aircraft giant Bell Helicopter is gearing up for China's burgeoning aviation market with one bulk order already in hand, company executives said. "Bell Helicopter is extremely bullish about China's aviation market with both strong demand and government support," said Patrick Moulay, executive vice president for global sales and marketing. "We will not only sell helicopters to the market, but also play a role in cultivating the surging market jointly with Chinese partners," he said in an interview with Xinhua. 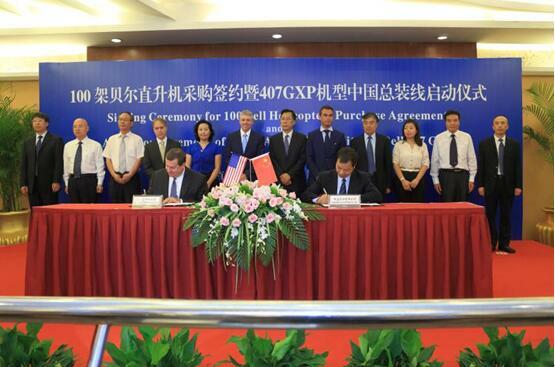 Moulay confirmed that Bell and Shaanxi Helicopter Co. Ltd. (SHC), a subsidiary of Shaanxi Energy Group, have signed a purchase agreement for 100 Bell 407GXP single-engine helicopters, which were launched in 2015. Deliveries will start this year. Bell did not disclose the total value of the order. The list price of the 407GXP is around US$3.2 million. The helicopters will be finalized in the Bell's U.S. plant, shipped to China and reassembled. Some will be configured for customers such as China's Emergency Medical Service (EMS), emergency rescue, fire fighting and law enforcement agencies. Bell will support Shaanxi Helicopter to develop capabilities in reassembly and maintenance, as well as pilot and technician training. Moulay said Bell has been developing its support and presence in China for several years. "The new order further establishes our commitment to the region." Since its founding in 1935, it has delivered more than 35,000 helicopters in about 120 countries and regions. The Bell Helicopter fleet in China is 110 and the company is excited about the vast potential of the market. Bell has received orders for 60 Bell 505s from Beijing-based Reignwood Group, including 50 at the 2016 China Airshow in November. The deliveries will start in six months. "We are very excited. And we are gearing up to triple the helicopter fleet in China by supporting our customers with training, maintenance and cultivating the market," said Jose Jacinto Monge, managing director of Bell in China. By the end of 2016, China's rotary-wing aircraft fleet was around 800, compared with about 6,500 in the United States. Helicopters play critical roles in public affairs, such as emergency services. The U.S. emergency services have about 1,200 helicopters. They are also fast transport for private and business use. China is set to boost the development of its civil aviation industry to create a market that is expected to be worth more than a trillion yuan (US$147.2 billion) by 2020. It will build new civil airports, bringing the total to more than 500 by 2020, and support the opening of its low-altitude airspace. Moulay forecast that China's helicopter fleet will double in five years. "We have seen much more flexibility in the low-altitude space for general aviation operators. And it is the right time for the industry to think over its role in the amazing market," he said.